Dubspot LA presents a new course on creating and editing music for visual media. 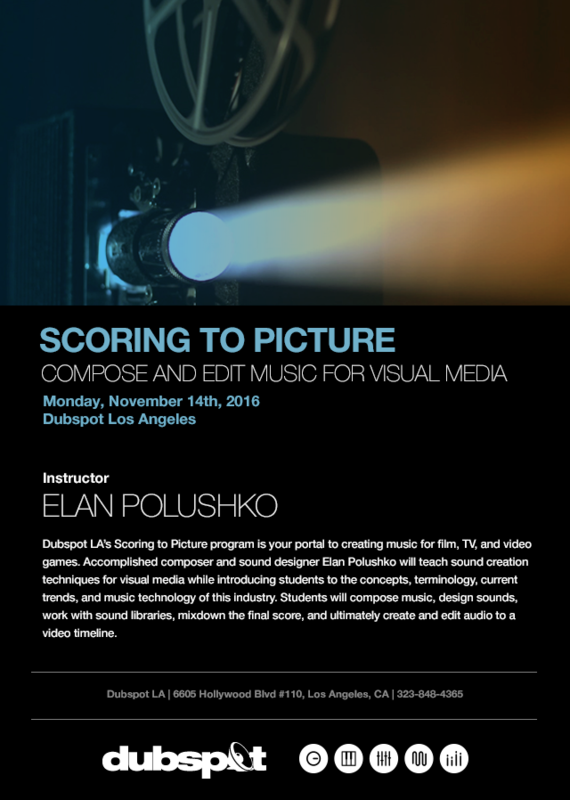 Join industry veteran Elan Polushko for Scoring to Picture, starting in Los Angeles November 14, 2016. Dubspot LA’s Scoring to Picture program is your portal to creating music for film, TV, and video games. Accomplished composer and sound designer Elan Polushko will teach sound creation techniques for visual media while introducing students to the concepts, terminology, current trends, and music technology of this industry. Students will compose music, design sounds, work with sound libraries, mixdown the final score, and ultimately create and edit audio to a video timeline. Learn the workflow of creation from pre to post production and final delivery of sound files to clients. For more information please contact our admissions department at 323-848-4365 or admissions@dubspot.com. Elan has over a decade of experience and schooling in music, performance, and audio production. Check out Elan’s work here.